Easy & Reliable One-click Data Protection. What does Renee File Protector do? Everyone has private information and files on computer or laptop which should get extra security. 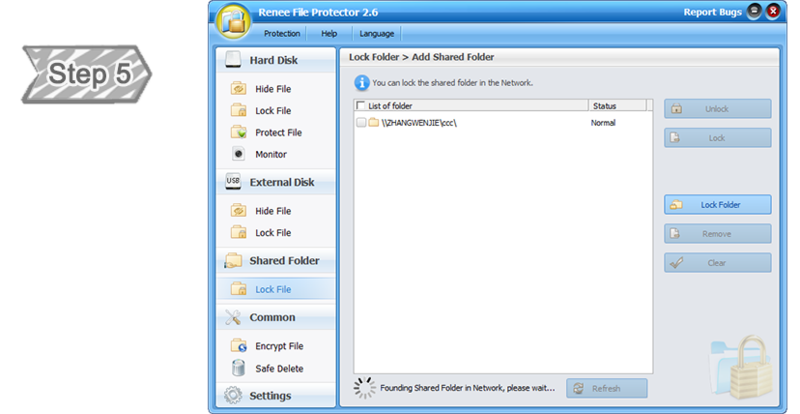 Renee File Protector provides total privacy and protection to your sensitive files, folder or even disk with advanced AES encryption algorithm. You can protect your file/folder/disk from modification or destruction by using Hide, protect and lock functions. Hide and lock folders in local disk and external disk are really helpful for users. Besides, monitoring your folders is also available. No need to be worried about unauthorized access of your files or regularly share your PC! 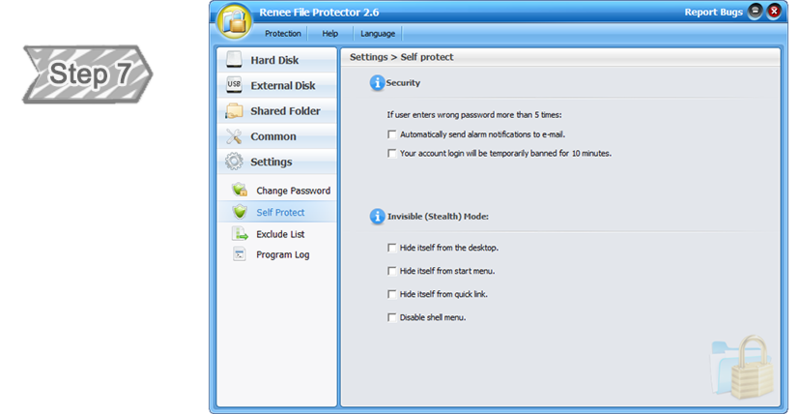 Renee File Protector is an ideal software when you are concerned with the security of your privacy and important data. Protect Data in External Disk – Password protect files/folder in external memory devices like external disk, memory card, USB, etc. Shared Data Protection – Lock shared folder to ensure the right people get access to the data. Hide Data – Supports to hide large quantities of files/folders/partitions in local disk at a time. Protect from Changes – Others can view the files but can not change or delete the protected files or data in the protected folders & partitions. Lock Data in Local Disk – Keep sensitive data in local disk from prying eyes with password with a few simple steps. Monitor Function – Records every activity of the monitored target in local disk with logs. 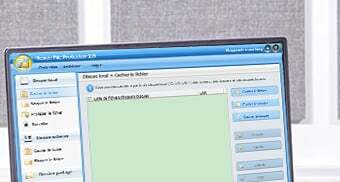 Safe Delete – Permanently erase the data you select and its trace. Beyond Recoverability! Instant one-click protections, like Hide/Deny Read/Deny Write/Encrypt, are available. Quickly and reliable. No matter trial version or paid version, Renee File Protector will not limit the number of file/folder/disk you select to protect. No need to go through the laborious and time consuming process anymore! No matter how many files or how large the files are, the protect process is instantaneous. Simply one-click drag and drop your files/folder/disk like music, videos, etc. from your computer into the software interface of Renee File Protector. Safe Delete function will permanently erase the data you select and its trace. Beyond Recoverability! 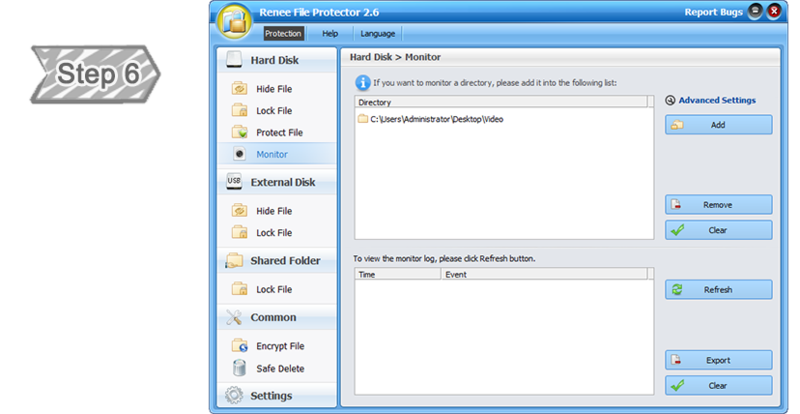 Renee File Protector also provides a monitor function which offers logs about when you view the monitored targets and its activities. Renee File Protector is a mature proven product which has been carefully tested over time to meet your specific needs and get the maximum flexibility and convenience. Multiple protection methods, including hide data, password protected, deny read, deny write and monitor, are available. 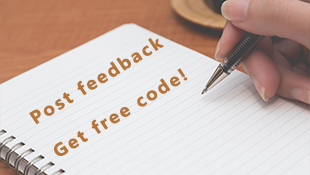 We guarantee that you won’t find any other better encryption product! No worries of privacy leaks/data theft/computer sharing. Perfect for newbie and professional alike. 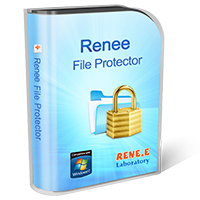 The first time you launch Renee File Protector, you need to set the master password which is for logging in the software and other functions. Provides lock, protect, hide function for files/folders/partitions in local disk. 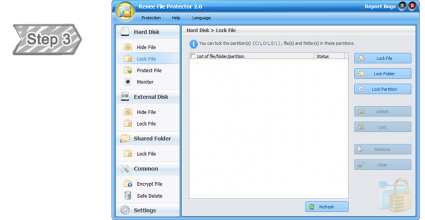 Provides hide & password protect function for files/folders in external memory devices. Provides password protect function for files/folders in shared folders. Knowledgeable representatives available to assist you through live chat or E-mail – any time of day or night. What could be done if I forget the login password of Renee File Protector? 1. 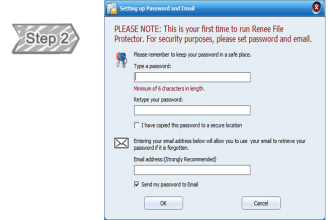 Find the password in the email address you have filled in when you set the password at the beginning; 2. Click the button named “Retrieve Password” on the left-bottom of the password enter interface and then follow the instruction. 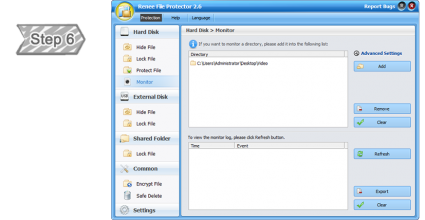 Will Renee File Protector modify my protected file? Absolutely no! 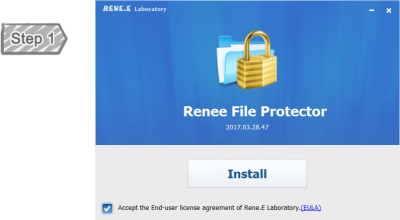 Renee File Protector will not modify your files in any way. It just protect your files dynamically by hiding/denying write/denying read/encrypting/monitoring. Can anyone else uninstall the software without my permission? Nobody can uninstall this software without the password. You can also hide this program in invisible mode. 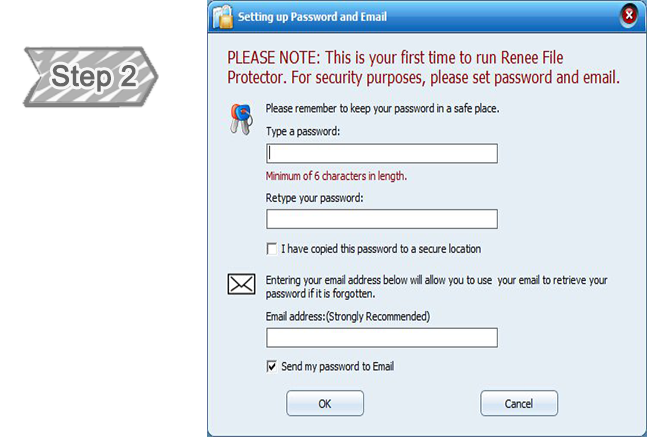 Alarm notifications will be sent to your pre-filled email once the wrong password has been entered over 5 times. Besides, multiple self-protections are provided in Setting. May I hide/lock the drive in which Renee File Protector was installed? Hiding the drive in which Renee File Protector installed in not available. For example, if you want to hide/deny read/deny write Drive C, you should install the software into Drives except Drives C.
You can purchase Renee File Protector via Credit Card, PayPal and Wire transfer. We also accept Bravo, Euro Card, JCB, Novus, Master Debit and Visa Debit. Really a convenience software! It can hide/lock whole drive in which I can store all files I want password protected! Just one click then I can lock the drive to prevent from reading or directly hide whole drive. I really love it! After looking for a long time for an easy-to-use but effective way to protect my sensitive files and folder. Then I found Renee File Protector. There is very minimal setup to perform the protection. Besides, I like the addition function - monitor which help me master the file activity better. Renee File Protector is a powerful and convenient software with a potent combination of different security levels. Its attractive and concise interface is really simple to operate. 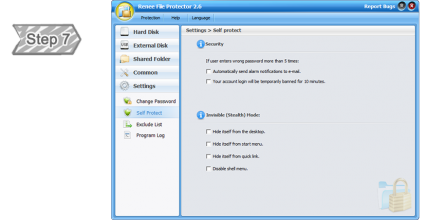 Unlike other security software, Renee File Protector really does what it state. Even under safe mode, my protected files are still being protected.